Ahead of an official confirmation, Samsung's latest Android powered mirrorless camera has gotten a full reveal of press photos and boy do they look great. The Galaxy NX has been leaked in all its glory, and although it's not confirmed to be officially released until June 20th, we can check it out now. And while it looks nothing like its predecessor, the original Galaxy Camera, it’s starting to look like Samsung is moving more towards the higher end spectrum with this latest reveal. With the ability to support interchangeable i- lenses (hopefully meaning compatible with current NX lenses) this new device jumps from your average point-and-shoot camera to the lines of a higher end DLSR camera. Samsung seems to be camera hungry, what with the recent announcement of the Galaxy S4 Zoom as well. 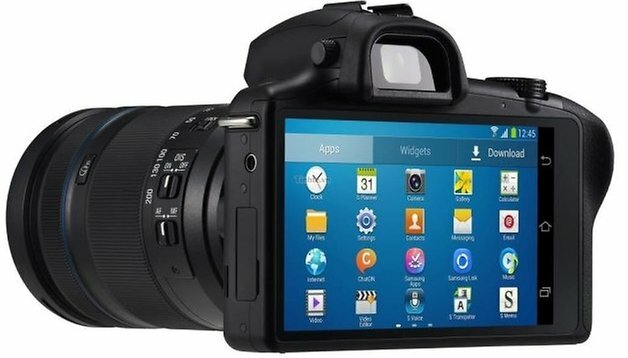 Just like the Galaxy Camera, the Galaxy NX will do away with a whole ton of physical buttons and the entire back of the camera is fitted with a 4.3-inch touch screen display. But don’t let that fool you, as Samsung still have opted for the standard physical buttons (shutter, poiwer button, swivel wheel for example) that everyone has come to know and love. Furthermore, the NX will run Android 4.2 and come with a 20.3 Megapixel APS-C sensor within it. For the full range of what we know about the specs of this device, check out the table below. What do you think about the Galaxy NX? A serious camera for serious photographer or just another novelty tech toy? I completely agree. Having the Android OS as the power behind a higher end camera really makes me want to get this. I've already had to root my Canon's OS in order to enable some better functions, so if I could get away from that clunky system, I'd be happier.